Follow your own path and ignore the allure of popular trends. Brandon Meeks is seeking to redefine how Gary, Indiana is only known as the home of the Jackson Family. 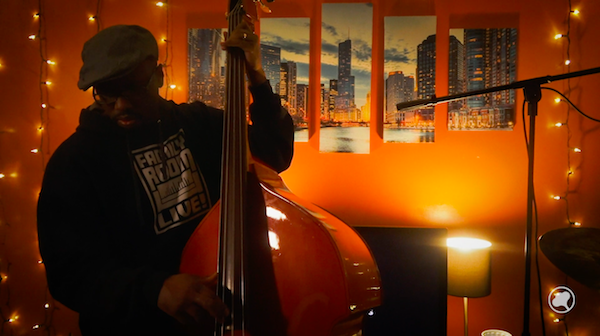 The independent bassist, producer, arranger, and beatmaker is gaining steam in the crowded world of Jazz, Hip-Hop and R&B by choosing to follow his own path and ignoring the allure of popular trends. Meeks’ professionalism and dedication to the craft of making music brought him to the attention of Don Cheadle. Brandon was cast in Cheadle’s 2016 directorial debut film, Miles Ahead—a movie about iconic musician Miles Davis. Brandon worked directly with both Cheadle and jazz artist Robert Glasper during the film’s production. He was chosen to play the character of legendary bassist, Ron Carter. Brandon’s skill as a jazz bassist was a major reason he was chosen to be in the film and this has allowed him to reach an entirely new fanbase. He is now taking full advantage of his good fortune and capitalizing on this moment by introducing people to all of the work he has done that allowed him to gain ground in the industry. Before Brandon was featured in Miles Ahead, he’s held the role of primary producer for the Indianapolis based Hip-Hop band Native Sun. Native Sun has been compared to The Legendary Roots Crew due to their use of live instruments in their performances and recordings. During his time with the band, Brandon has created 2 magnetically soulful albums plus a series of sharp, compelling videos that have earned the attention of influential cultural tastemakers such as AFROPUNK and Team Backpack. His efforts to share Native Sun’s music and build his audience has resulted in over 500 thousand views, 10 thousand shares and over 1 million people reached around the globe. What’s more amazing is that he has done this while also managing the band’s social media, his own social media and website and the creation of content that has made his website one of the more active and engaging platforms in indie music. Brandon’s work with Native Sun is bolstered by his work with noteworthy jazz and soul artists. He regularly plays bass with Rob Dixon, The JD Allen Trio, Zo! of The Foreign Exchange, Sy Smith, Nicole Henry and is a part of The William Menefield Trio. Meeks also holds residencies at famed and historic jazz clubs such as The Chatterbox (Indianapolis) and Greenwich Jazz Club (Cincinnati). With all of this on his plate he continues to spend time sharing what he is working on with those interested. This has enabled him to create a brand that is conscientious. Brandon listens to the people; which allows him to produce music that fuses thought provoking concepts with authentic, high-level musicianship and haunting melodies. His sound gives listeners an alternative to the current trends of mainstream music. This mission has most recently led Meeks to release an album of lofi hip hop instrumentals entitled Talk Music and to create a series of online interactive concert videos called Family Room Live! Brandon is determined to give great music to people who have been forgotten about by the mainstream industrial music machine. He strives to be an inspiration to artists who aspire to be successful while remaining true to themselves.